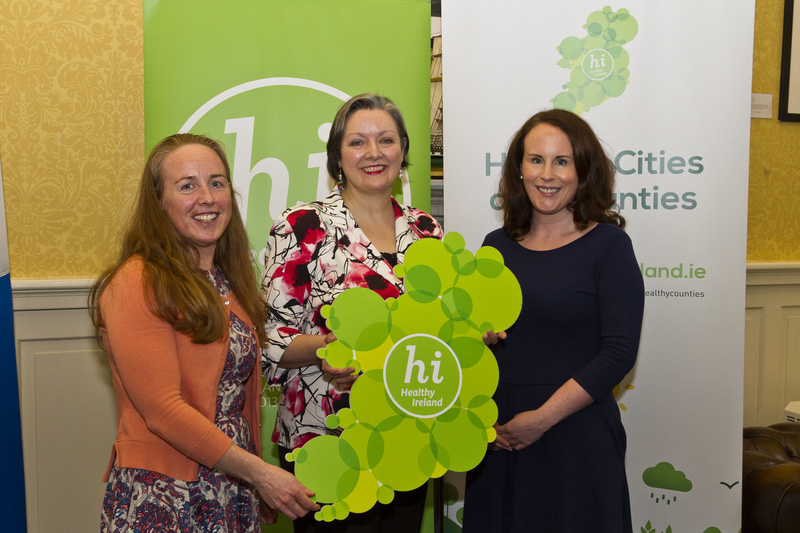 Members of the Healthy Waterford Steering Committee with Minister for Health Promotion, Marcella Corcoran Kennedy at the launch of the National Healthy Cities and Counties of Ireland Network. 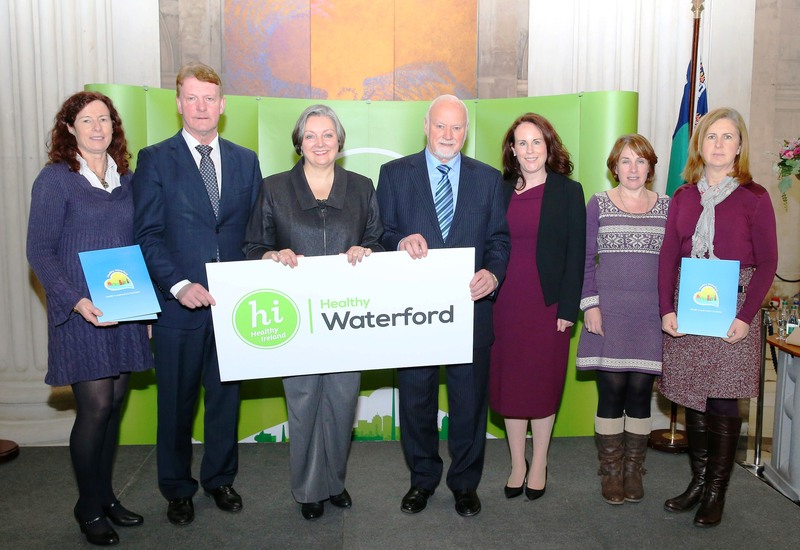 Waterford is a founding member of the National Network of Healthy Cities and Counties. The network aims promote lifelong health and wellbeing, provide a means where local issues can influence national policy, and provide a voice for Ireland in the WHO Network of European National Healthy Cities Networks. The Healthy Cities and Counties approach to health and wellbeing recognises the need to work in collaboration across public, private, voluntary and community sector organisations. Many factors affect our health – where we live, our environment, our genetics, our income and education level, our relationship with friends and family. These factors (‘determinants of health’) are often outside the direct influence of health and social services. The Healthy Cities and Counties way of working and thinking includes involving local people in decision-making requires political commitment and focuses on organisational and community development. Healthy Waterford delighted to welcome the Minister for Health Promotion! Healthy Waterford was delighted to welcome the Minister for Health Promotion, Marcella Corcoran Kennedy, T.D recently. 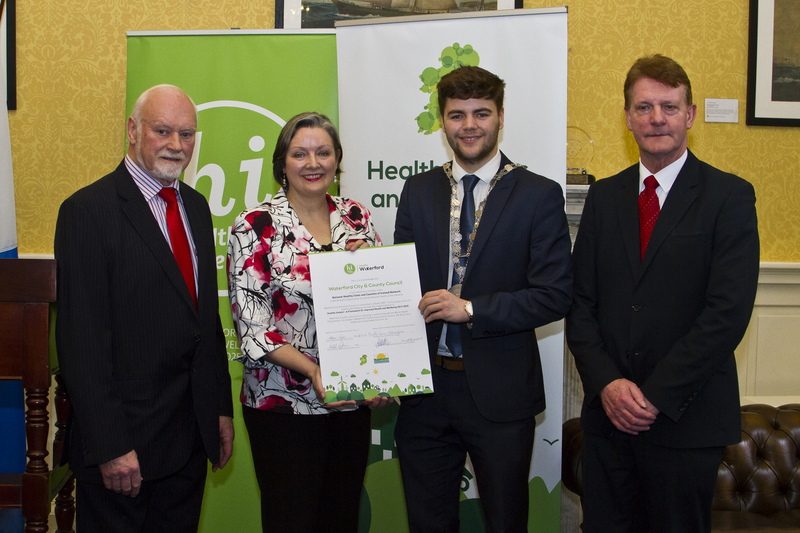 The Minister visited to recognise Waterford’s involvement in the World Health Organization Healthy Cities Project over the past seven years and to present a certificate of accreditation to the National Healthy Cities and Counties of Ireland Network. The certificate was accepted on behalf of Waterford City and County Council by the Mayor of Waterford City and County, Cllr. Adam Wyse and Michael Walsh, CEO, Waterford City and County Council. With the significant development in 2013 of Healthy Ireland – the National Framework for Improved Health and Wellbeing – the WHO Healthy Cities model has been identified as the way to develop key partnerships at the local level to implement Healthy Ireland. Healthy Ireland aims to shift the focus to prevention of diseases, seeks to reduce health inequalities, and emphasises the need to empower people and communities to better look after their own health and wellbeing. Minister Corcoran Kennedy, T.D., congratulated Waterford City and County Council on having the vision to be involved in the WHO Healthy Cities for the past seven years and for making a commitment to work to become healthier places for all. Minister Corcoran Kennedy added that “as a former elected member of a Local Authority I know that Local Authorities are uniquely placed to bridge the gap between national policy and local implementation. I know the influence and reach that Local Authorities, in particular the recently formed Local Community Development Committees, have in every community and I see huge potential for them to contribute to building a healthier Ireland”. Cllr. John O’Leary, who is a member of the Healthy Waterford Steering Committee, explained that “as the influences on health such as employment, environment, transport, housing, community development, and food supply are so varied and complex; to address health issues and promote good health, it is important to take a multi-agency approach. Healthy Waterford provides this focus and space”. Cllr. O’Leary added that “it is great for Waterford to receive this recognition of the work being undertaken. Some key areas being progressed, as a direct result of our involvement with the WHO programme, include health literacy, social prescribing, #kindwaterford mental health and wellbeing initiative and the annual Mayor’s Health Week”. Mayor of Waterford City and County, Cllr. Adam Wyse thanked the members of the Healthy Waterford Steering Committee for their commitment to the project stating that “building relationships and strengthening partnerships were critical to developing a truly Healthy Waterford”. Cllr. 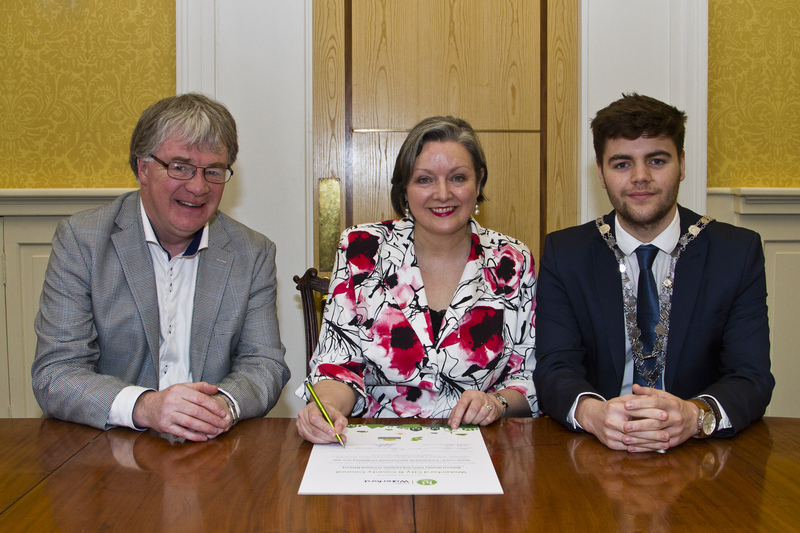 Wyse added “I look forward to further supporting the development of the project in Waterford. Fiona Donovan, who is coordinator of the National Healthy Cities and Counties of Ireland Network commended Waterford for ‘leading the way in promoting health and wellbeing through social innovation, for example #kindwaterford, and also reducing health inequalities through improving health literacy. Adapting the National Health and Wellbeing Framework – Healthy Ireland – to the local context – Healthy Waterford – through engagement with local agencies, community groups and most importantly the people of Waterford, is critical for real change to promote and improve the health and wellbeing of all in Waterford”. In addition to Waterford City and County Council, Galway City Council and Cork City Council have also received certificates of accreditation for their involvement in the WHO Healthy Cities Project, ten and seven years respectively. 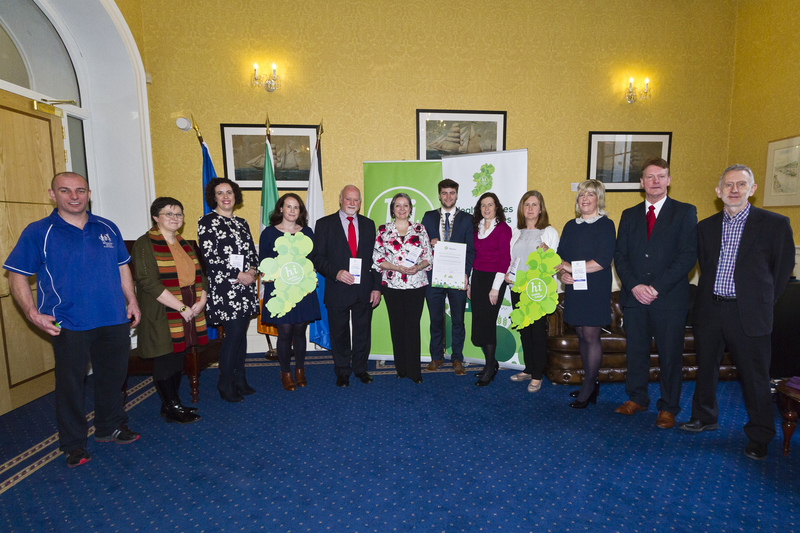 The first counties in Ireland to receive accreditation to the National Healthy Cities and Counties Network are South Dublin County and County Offaly. Waterford Greenway – Ireland’s longest off road walking and cycling path! #KindWaterford – What does kindness mean to you? Mayor celebrates Waterford’s designation as World Health Organisation Healthy City for the second time!